What is Marriott Best Rate Guarantee Policy? In order to compete with the online travel agents, Marriott wants to assure you that you’ll always get the best rate available when you book directly with Marriott. If not, they will match the lowest rate and give you extra 25% discount. Well, it seems you have no reason to book anywhere else. Also, when you book directly with Marriott, you are able to earn Marriott Rewards points and credits toward elite status. Book a Marriott room using any Marriott reservation channel (Marriott.com, Marriott Hotel Telephone Reservations, or directly at a hotel). If within 24 hours of making your reservation, you find a lower hotel rate for the same hotel, room type and reservation dates, then submit a qualified claim form, Marriott will match the rate and give you an extra 25% discount on the room. If you found a lower rate through a Marriott Reservations Channel, a travel agency, or a travel management company, you must reserve the second reservation before completing the claim form. If you found your lower rate through a non-Marriott Internet site, you do not need to make a second reservation, but you will need to provide the Web address where you saw the lower rate. 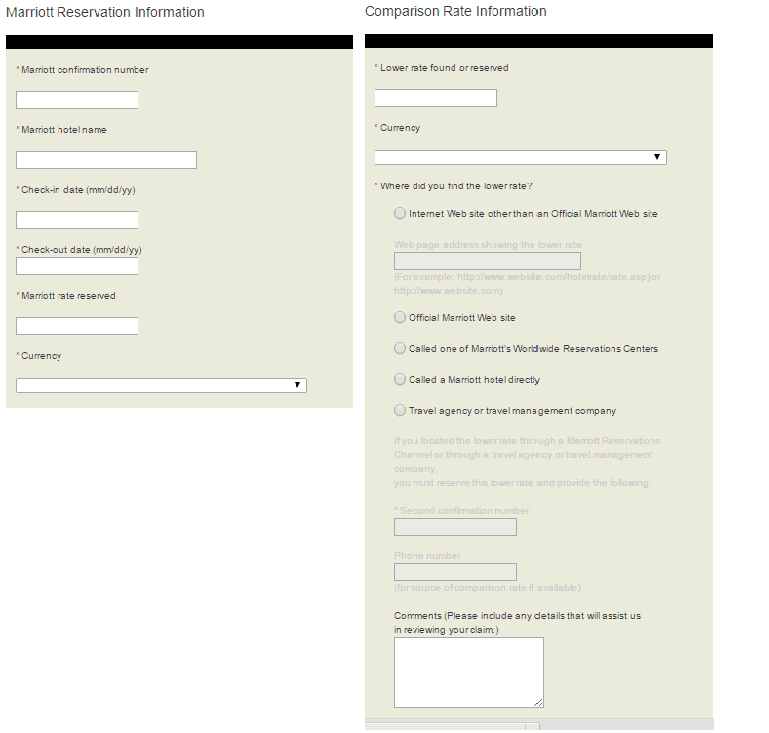 When submitting the form, you need to provide the information of the room rate reserved at an official Marriott source and the “Comparison Rate” information such as room rate, currency, where did you find the lower rate, and a completed Claim Form has to be submitted within 24 hours and must be for the same hotel, room type and reservation dates. The Best Rate Guarantee does not apply to the following: Delta Hotels, Protea Hotels®, Ritz-Carlton Montreal, The Ritz London, Hotel Ritz Madrid, and Ritz-Carlton Residences. One reservation must be made through any Marriott reservation channel such as Marriott’s worldwide reservations centers, a Marriott hotel or an official Marriott website, for one of the following brands: JW Marriott®, Renaissance® Hotels, Autograph Collection® Hotels, Marriott Hotels®, Marriott Vacation Club®, Marriott Executive Apartments®, The Ritz-Carlton®, Gaylord Hotels®, AC Hotels by Marriott®, Courtyard®, Residence Inn®, SpringHill Suites®, Fairfield Inn & Suites® , TownePlace Suites®, Moxy Hotels®, Atlantis, BVLGARI®, and EDITION®. The “Comparison Rate” must be found, and a completed claim form submitted, within 24 hours of booking the reservation through the Marriott reservation channel and must be for the same hotel, room type and reservation dates. In addition, if the Comparison Rate is found on the day of arrival, the claim must be submitted by 11:59 p.m. of that day in the hotel’s time zone in order to ensure timely processing. Marriott will verify the Comparison Rate within 24 hours of receiving your claim and notify you of the results. For claims submitted on the day of arrival, the claim will be processed within approximately four hours. Rate comparison will be made net of any taxes, gratuities, or any other fees associated with the room rate, and the Comparison Rate must still be available at the time Marriott validates the claim. Rate disparities primarily attributable to fluctuations and/or differences in currency exchange rates are excluded from the guarantee. Marriott may deny claims where the difference between the comparison rate and the rate on the Marriott reservation channel is less than $1. Comparison Rates applicable to only a portion of your entire scheduled stay will not be honored. Comparison Rates applicable to a multi-day stay will not be honored if the total room cost of the stay is the same or greater than the total room cost through a Marriott channel.